hi guys baka may interested, im selling my skateboard. di ako talaga skater so di ito nagamit for tricks, just for cruisin around. Sa facebook try mo sa group na Longboarding Philippines or i-like mo yung page na Jackass Project Skateshop. I use my longboard mainly for cruising pero pwede rin magtricks sa flatland. Mas cool pa minsan tingnan. just saw original penny boards sa billabong power plant mall.. affordable na rin! going back to skating, any skate shops in south area you know? metro manila south ba sir? check facebook pages of jackass skateshop, aloha boardsports, stoked.inc. also there is one in market market taguig, but i don't know the shop name. Anyonehere na nakatry na sa Circuit magskate? how much and anong rules? helmet? haha baka sabihin niyo hipster ako hahahha penny board lang ako..
sobrang ganda kaya ng penny! pero may karapatan silang mag angas! dami paved downhill ditto, sarap sa longboard at penny! Sa pagiikot ko sa isang thrift store, nakakita ako ng used trickboard. I think it's just a generic trickboard na good enough for a noob like me. 1st- while trying to land a pop shuvit, akala ko kaya ko pa kasi nakapag ollie pa ko kahit mababa... Pero sablay, ayun, twisted ankle, inagapan ko na lang ng cold and hot compress. Hindi ako nakalakad for a week. Actually, hanggang ngayon ay hindi pa fully healed. 2nd- while cruisin' sa isang trail., medyo pababa at nag gain ako ng speed kaso, may tinamaan akong pebble... Ben tumbling ang action ko eh., galos sa tuhod (magaling na). I'm planning to buy a "good" one in the near future., may nakitaan ako dito na naka trickboard with big wheels. Parang sarap i-ride. We'll see. Post ko next time yung chipengpeng kong trickboard. ^Musta na siao? musta healing process? ang "hindi" dapat generic e yung trucks para sa safety na rin. Happy Go Skateboarding Day sa inyo this Sat!!! Yep! Happy Go Skateboarding Day! then lipat kami sa covered spot. hot, humid, its summer, so ok lang yung ulan, refreshing. i hope, ok din ang GSD diyan, tiyak mas madaming tao. I bought a generic skateboard last Feb. Di naman ako skateboarder talaga, parang, "wow mura, something new to learn kahit 25 na ako, I'mma get one." tapos nakaka 10 meters na ako sa isang kickoff. sa semento (while cruising, so sad). Ayun, syempre, dust off ganun, ok lang naman masakit sa pwet. just to be safe. I had to lie to the doctor at the ER though, on why I have a sprain. When I started skating, I also fell down, couple of times. And still falling now with some minor or major falls, hurting bones here and there. Well, you will need to figure out what you eventually want to do with your skateboard. 1. Do you wanna just ride & cruise? 2. Do you wanna cruise & jump over some small obstacles while cruising? 3. Do you wanna cruise fast down sloped hills/roads? 4. Do you wanna do ticks, flips & jump ramps & rails? 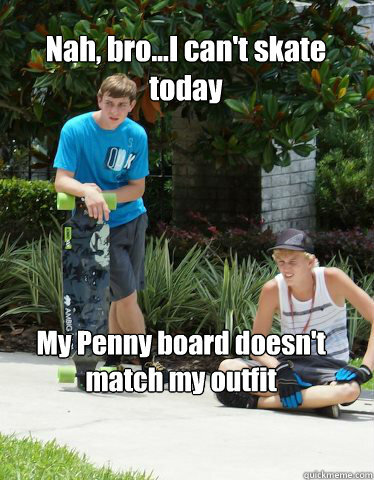 To start, if your board is between the size of a penny & a longboard, it could be a cruiser board, which is fine. If the wheel don't give you that much speed, that's fine as well. You will need to practice riding & mastering your balance while riding at slower speed. Then if you well mastered & handling riding on your current setup, and feel the need for much faster cruising experience, change your wheels first. A suitable cruiser set of wheels & bearings. Check your local skate shop to help you out. When you get on riding at faster speeds and want to progress from there. Decide what you want from the questions above. Check out some youtube tutorials about skateboard riding basics. I've seen tons of vids there that can help you out. There is no age limit in learning something new. Important thing is to enjoy while your doing it. And stay safe pa din. Wear protective gears if needed. thanks for the great info! I won't be getting into tricks so I guess I'll be getting another kind of board, once I learn how to find my balance on my current one. I've never heard of a cruiser board though, what's the main difference from a longboard? AFAIK, a penny is like a really tiny plastic version of a longboard, because the wheels are made for cruising (the big flat kind), and you can't jump longboards because they're really big and wide and has a good amount of flex. Bad Behavior has blocked 76403 access attempts in the last 7 days.